The huge, basically exponential, growth of the pharmaceutical industry is impossible to ignore – in general we are starting to turn to our doctors more and more, expecting “a pill for every ill” – which however is not the right way to go about health in disease – but that’s another whole topic all together. The FDA (Food and Drug Admin) has already fastracked many drugs, only having to retract them, and food items, from our grasp because they suddenly realised (or realised they were closer to getting in trouble for) the’ve been supplying the public with something considerably dangerous. 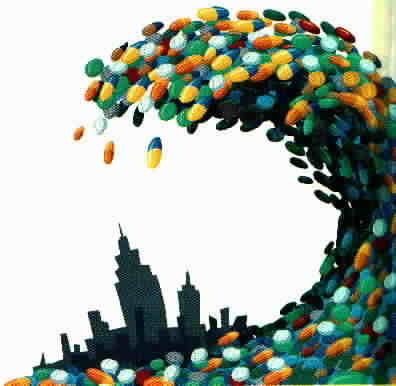 Just for an idea about the growth, reports show that $1.8 billion was spent by pharmaceutical companies on mass media advertising of prescription drugs in 1999 – a 38.5% increase over 1998; the amount for 2000 is expected to top $2 billion. Meanwhile, sales have risen substantially over the past several years, for eg. about 19% between 1998 and 1999. That’s a lot, and it just keeps rising. Many drugs work by blocking a normal chemical pathway in the body, and because one pathway is blocked, it actually affects other pathways in the body that the blocked pathway would usually also have done (other jobs), hence “side effects”, when that pathway is “missing”. All drugs work by altering some process of the body, and it is amazing how our bodies cope with it and can still produce all the millions of DNA bits (proteins) in the right order in all our invisible cells that make up our body. By mass precription (many drugs are in fact over-prescribed), and by repeatedly inhibiting/changing how the body does it’s thing, it is of concern whether “the wind will change our faces”. We are lucky that we have dealt with all the chemical pollution in our lives and can still feel fine, but, like the pancreas in the rising rate of Diabetes, perhaps there will be a point where our bodies will say “no more”, and then it will be too late. Drugs definitely have their place in this world, but they are definitely way over-prescribed.